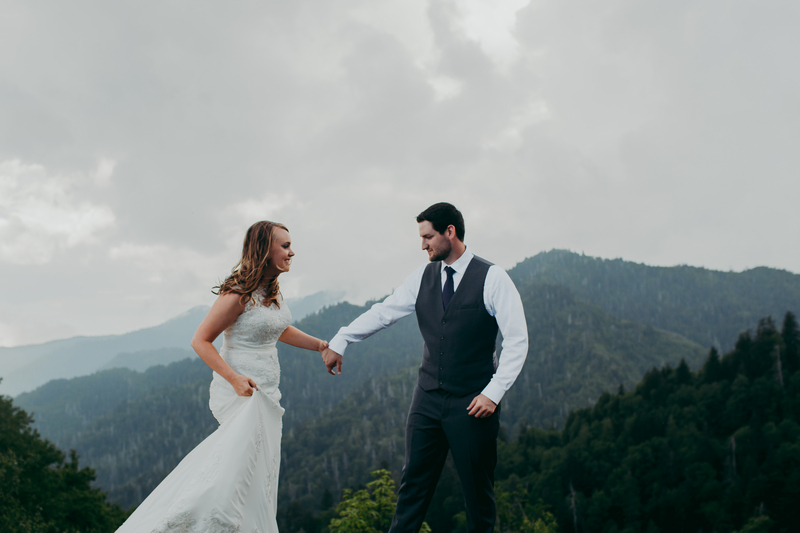 Earlier this summer we had the opportunity to travel down south to the Smokey Mountains to celebrate Shelby & Terry’s mountaintop elopement! Although we often do destination weddings, this was the first time where roles were switched. Brad is longtime friends with the groom, Terry, and had been asked to be in the wedding as one of the groomsmen. However, it was also their hopes to have Brad Hart Photography document their wedding day! The two of us flipped our usual roles, and I was able to be the main photographer, allowing Brad to second shoot as he was able to but also join in with all of the celebrations. It was both a challenging and fun experience and I am thankful for the opportunity to grow from documenting their special day! Congratulations to Shelby & Terry! Cake: Mother of the Bride, Melody Weir. Ceremony Location: Newfound Gap, Smokey Mountain National Park. Reception Location: Twin Creek Pavilion, Smokey Mountain National Park. Reception Decor: Mother of the Bride, Melody Weier.